Education has always been one of the propaganda bulwarks that the Regime of Havana has used to sell the image of Cuba as a perfect, paradise society. Like so many others, this has resulted in a lie of gigantic dimensions. But it’s no secret that lately the profound crisis in which the Cuban educational system is plunged has become more and more evident. 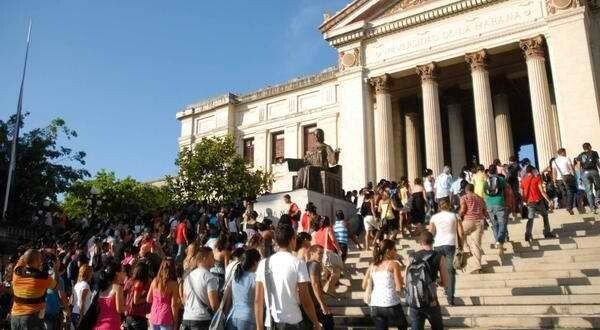 Fraud, the selling of exams, poor academic results and the critical shortage of professors are some of the reasons that the system of Cuban education, so acclaimed, free and promoted, is in trouble. Each one of the levels of teaching, by its intrinsic characteristics, suffers decadence in its own way. This time I propose to explain my vision of the problems that presently afflict higher education in our country. Articulating problems and blowing off steam is something that’s been done for more than 50 years; many of us Cubans know very well how to do it – some freely and where they like, and others in the context they consider convenient and comfortable. So I’m going to comment similarly about the general proposals that our movement, Somos+, has put forth, for the education reforms, which, we are convinced, will take place when we finally have the freedom to implement a system of informed assessments, with our vision fixed on prosperity for the country and freedom for each citizen. One of the main problems of higher education in Cuba is that our students can’t gain access to all the information generated in the world about the different subjects of study. They have to learn generally from already out-dated books with retrograde visions and/or prejudiced material, where each paragraph is totally politicized. This fully puts the brakes on the possibility of continually modernizing the study programs, and, of course, it circumvents the professors. The consequence is that in more than 50 years of isolation, our teaching plans are invalid, and many of our professionals, at the same instant they graduate, aren’t able to compete in the world labor market, which has become more demanding and specialized. Another visibly problematic situation is the increasing absence of professors able to give classes with the level of excellence that a university requires. The potential recent graduate prefers to look for a way to emigrate (scholarship, marriage, jumping on a raft or a flying carpet, and the indices of retention are almost null in the principal faculties. Also, the best professors we once had are now retired, and others have taken the path of emigration or have gone to more profitable jobs, working in hotels or tourism. These points make it obvious that our educational system needs a radical change; our movement proposes, above all, that education continue to be an inalienable human right of greatest priority, and that the educational process be thought-out in a universal way and that all the information that humanity has generated be put within reach of all students. We reject all the indoctrination, loyalties, myths and personality cults. For us, education will be a vehicle for the liberation and growth of man, materially as well as spiritually, consumed from all sources, taking as the base the spring of our nationality. Another question is of the greatest importance: it’s that young people have less motivation to take university courses, which is understandable: for them it means investing five years of their lives studying without earning anything in order to later present their skills in exchange for salaries that don’t even cover basic necessities. Now, faced with the dichotomy between Engineer or Culinary Worker, our adolescents clearly know that serving in a restaurant brings them closer to their daily bread than a day designing bridges. Consequently, there has been a considerable reduction in university graduations these last years. This, added to the massive exodus of professionals, is, short of alarming, an urgent call to action for the future of our country. Our movement proposes, in the interest of minimizing the flight of qualified personnel, that the remuneration for professors be in accord with the importance of education in any society. This is a moral duty of the Nation. In the next post about the subject, I’ll expose the essence of these measures and give my opinion about their effectiveness. I’ll continue to comment on some of the problems and will try to shed a little light on the debate about the preparation of our youth to assume the challenge of bringing clarity and growth to the new Cuba, which we seek, and the need to include them in decisions about the future of education in our country.